Hidden treasures are released and forgotten in every generation. With the plethora of big titles from the Sega Saturn, Playstation and Nintendo 64 era, it was easy to miss some of the great games that were released exclusively on each console. This week, I take a look back through the blue glasses to the heyday of Sega. The Sega Saturn was marred with a string of failures for Sega in the early to mid-nineties. The Mega/Sega CD released shortly before the 32X, which sparked debates between Sega America and Sega Japan. The string of hardware releases which attached onto the lucrative MegaDrive/Genesis confused the marketplace. This set the tone of general apprehension for the next big Sega thing. Cue the Sega Saturn. At the time, it was reportedly difficult to program, and there was dwindling third party support. However, hopes were held high in the generation of Sega fans who grew up with the little blue hedgehog, Sonic. What we wanted, as fans, was a Sonic game in full 3D glory, taking advantage of the extra memory and extra blast processing. 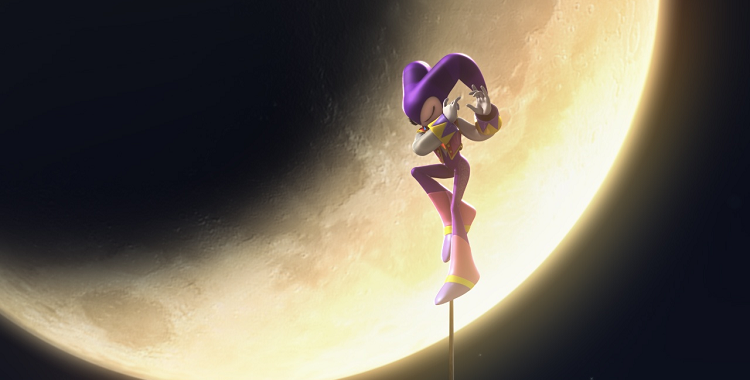 Screen shots were leaked to the media of a game which was never meant to be; what was delivered to us from Sonic Team instead was something magnificent, NiGHTS: Into Dreams. When Yuji Naka, the father of Sonic, sat down and began work on NiGHTS, he reportedly sought inspiration from a very unlikely source, the Swiss psychotherapist Carl Gustav Jung. The effects of this inspiration is not immediately apparent, but this is what NiGHTS is all about: layer upon layer of intriguing gameplay. NiGHTS starts with the player taking control of a child, either boy or girl with different levels for each, and through an unfortunate event you enter a dream world inhabited by unearthly and colourful creatures along with the main protagonist who you control, the mysterious NiGHTS. Essentially, in gameplay terms, you fly around as NiGHTS collecting blue Chips and taking them back to floating ‘Ideya Captures’. Collecting 20 blue Chips then releases the Ideya for the different course on each level, which you then have to return to the home area before continuing onto the next course. Sounds simple? Well yes it is, and this is the beauty of NiGHTS. You can breeze through the game doing the standard required pass mark before getting to the bosses, many resembling beings that have swallowed a large beach ball. But there is much more to discover. Also inhabiting the dream world is the nightopians, little creatures that you can hatch from eggs, breed and push into fallen enemies. The artificial intelligence of these creatures and the side game is not as complex as the Chao to feature in future Sonic Team titles; however, it is mindful to remember that this was created in 1996, a year when saved games was just in its infancy. You can easily put in hours caring for your little nightopian compatriots who inhabit each level. The other component of NiGHTS not immediately apparent is the point system; the real aim is to collect the Chips as fast as possible then, as the clock counts down, collect as many points as you can by performing strings of combos. This would be near impossible with a standard digital pad which was common at the time, but cue the next phenomenal piece of tech rolled out by Sega… the NiGHTS pad! Oooooh! Ahhhhh! I know it looks a bit like a pancake with buttons mashed on the front, but trust me, it is comfortable and the circular 3D pad allows you to motion NiGHTS in unending loops with relative ease. Christmas NiGHTS in all its colourful glory! Shortly after NiGHTS‘ release, Sega gave out Christmas NiGHTS in a number of different venues. Christmas NiGHTS is the first levels of NiGHTS with a massive Christmas theme thrown over the top of the solid gameplay. The already upbeat music is flittered with Christmas bells, and it is still a favourite of mine to pull out every Christmas and play through. So all in all, NiGHTS is a wonderful game, but why, I hear you ask, do I start my reviews off with this little gem? Well it’s simple: it is available on PS3 and 360 right now! As a bonus, it also comes with Christmas NiGHTS! If you’re still reading this while you’ve booted up your system to download the game, I can confidently say that the game will change your life. Go on, get dreaming! So that we are able to better understand our viewers’ perspective and give you more of what you want and less of what you don’t, please leave a comment (positive or negative). Care to offer another perspective on something? New Web Series – Star Trek: Renegades! A New Look at Geek Pride: SyFy’s Fangasm!